Rivers and Mirrors: Part I is a musical work based on poetic reflections on the theme of rivers and mirrors that poses the question “to be in the mirror or to cross the river.” In his enigmatic and hypnotic mix of music and images, Edelstein creates a concert with an atmospheric sense of history, memory and longing. His non-standard, “un-classical” approach to the piano has the distinction that he is as a composer who plays the piano, rather than a pianist - and this conjures up new possibilities of sound and expression in the piano. New layers of meaning are added to the recital with the silent video presence of dancer Sandra Grinberg (Trisha Brown Dance Company) moving alone amongst dust and concrete in an empty factory, and among the bare bookcases of the famous library in Buenos Aires where author Jorge Luis Borges once worked. In the final of the concert evocative vocals by Deborah Claire Procter added to the atmosphere as they combine with the virtuosic piano playing of Oscar Edelstein. 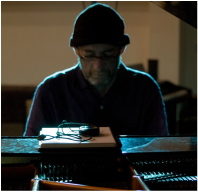 OSCAR EDELSTEIN is an award winning Argentinean composer & pianist, renowned for his inventiveness and originality. He is frequently described as leading the avant garde from Latin America & opening new horizons for modern music. His music succeeds in crossing the line between the classic, the popular & the contemporary, winning enthusiastic audiences captivated by his compelling use of rhythm, theatricality, passion & emotion creating what leading critic Federico Monjeau called “profound and fascinating music.” In 2011 his work Cristal Argento I was commissioned & premiered by Basel Sinfonietta. His career is has been continually distinguished for breaking new ground, and having been awarded important prizes throughout, in 2011 he was honoured with the highly prestigious award from the National Arts Foundation of Argentina for out-standing artistic achievement and was made Citizen Illustrious of his hometown. SANDRA GRINBERG started working with the Trisha Brown Dance Company as an apprentice having begun dancing as a child in the the national ballet school of Poland. On graduating she went to study at the famous dance school P.A.R.T.S. in Brussels. After leaving P.A.R.T.S., Sandra Grinberg continued her studies at the Trisha Brown Studio. She entered the Trisha Brown Company in 1999, and performed with them internationally as one of their senior dancers and teaching Trisha Brown repertory in New York and worldwide, including in place such as London’s Moving East dance studios. More recently she has taken a break to raise a family.